Our Feed6 team co-hosted a very special meal packaging event on February 28,2016 in partnership with Trinity Volunteer Corps and Dominican University. This amazing event was hosted by Dominican University in the Palmer Hall atrium. During the event over 50,000 meals of Macaroni and Cheese were packaged and donated to local food pantries. Additionally the Greater Chicago Food Depository was a major benefactor. 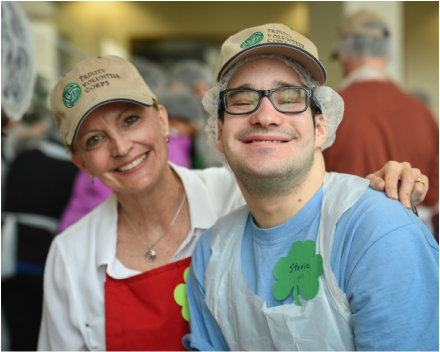 What made this Sunday event so special is that among the 300+ volunteers were over 100 developmentally disabled adults who were associated with the Chicago based TVC (http://trinityvolunteers.org/). They brought amazing joy and sweet energy to the program - and in that TVC provided individual coaches who partnered with each disabled adult.